U.S. tobacco companies had a solid year while global counterparts saw challenges. The tobacco industry has delivered solid returns over the long run despite facing plenty of challenges along the way. Between litigation, regulation, taxation, health concerns, and changing consumer preferences, the world's largest producers and marketers of cigarettes and other tobacco products have had to change gears in order to adapt to the new environment in the industry. In 2016, domestic industry leaders Altria Group (NYSE:MO) and Reynolds American (NYSE:RAI) delivered double-digit percentage total returns to their shareholders. Those who focused on the global market weren't as lucky; Philip Morris International (NYSE:PM) and British American Tobacco (NYSE:BTI) only managed to post more modest gains. 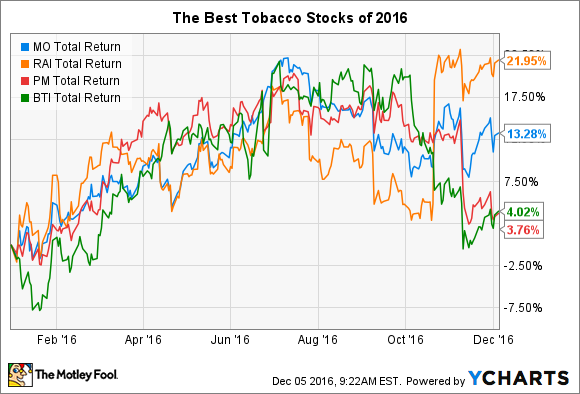 Below, we'll take a closer look at how the best tobacco stocks trading on U.S. markets fared this year. MO Total Return Price data by YCharts. The striking contrast in returns within the tobacco industry is most obvious when you look at the U.S. market and compare it to the wider global market. Part of the reason Altria and Reynolds American have done so well is because the U.S. economy continues to fire on all cylinders, with plenty of support for consumers who buy their products. Low gasoline prices have added to consumers' discretionary spending capacity, and given how frequently smokers purchase cigarettes at gas stations, the link between what you pay at the pump and how much you have left to spend for other things is important. By contrast, the strong U.S. economy played a role in holding back Philip Morris International and British American Tobacco. For Philip Morris, the fact that financial results get translated back into U.S. dollars has hurt the company in recent years, because American economic prosperity has led to considerable dollar strength. Currency-related factors began to wane in the middle of 2016, but a new push higher following the U.S. presidential election could point to renewed pressure on profitability for Philip Morris if it continues. Meanwhile, for British American, the Brexit vote for the U.K. to leave the European Union had a huge currency impact of its own. When you look at British American shares in their home market on the London Stock Exchange, you'll find that the stock has climbed almost 15% in British pounds. However, the depreciation of the pound compared to the dollar so far this year has almost completely wiped out those gains, leaving U.S. investors in British American with only minimal gains. The other big event in the tobacco industry in 2016 came from multiple moves on the mergers and acquisitions front. Not all of them directly involved tobacco businesses, but they nevertheless had an impact on these large players in the industry. The biggest direct impact on the tobacco industry from M&A came in October, when British American Tobacco offered to buy out the remainder of Reynolds American that it doesn't already own. The autumn move sent Reynolds stock up by around 15% when it was first announced. With British American already owning about a 42% stake in Reynolds American, the idea of a full merger has been on the backburner in investors' minds for quite a while. Moreover, as regulatory schemes around the world start to converge on each other, the benefits of having U.S. entities that are separated out from their international counterparts have waned. Reynolds rejected BAT's initial offer, but many expect a higher offer to come and for BAT eventually to be successful. In addition, some believe the move could spur Philip Morris to make a similar offer to Altria, reuniting the entities that separated themselves almost a decade ago. The other big M&A move affecting tobacco stocks was the merger of beer giants SABMiller and Anheuser-Busch InBev (NYSE:BUD). That's relevant to tobacco because Altria owned a substantial stake in SABMiller, and as a consequence of the merger, Altria now has about a 10% interest in Anheuser-Busch InBev. The decision to hold onto an equity interest rather than simply cashing out was partly tax-motivated, but Altria also believes it benefits from the diversification that exposure to the beer industry brings to its tobacco business. Shareholders will be happy that these four big tobacco stocks managed to avoid losing ground in 2016, although owners of Philip Morris and British American might wish they'd chosen their U.S. counterparts instead. Looking forward, it will be interesting to see whether the momentum Altria and Reynolds American picked up this year will continue into 2017 -- or whether one or both might disappear as independent entities in the near future.